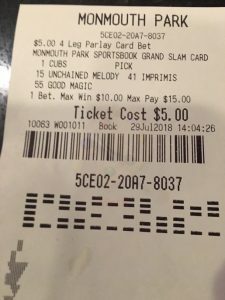 While Sunday marked the 51st running of what is now known as the betfair.com Haskell Invitational at Monmouth Park Racetrack, it also marked the first time that visitors had the option to both bet on the horse races and wander over to William Hill’s adjacent sportsbook and bet on … well, almost anything. The total handle for the day — one of the biggest of the year in U.S. thoroughbred racing — was $13.4 million, an increase of 5 percent over 2018. There were seven head-to-head matchups available, with bettors choosing between two comparable horses in the 12th and final race of the day. That drew about $15,000 in bets. Another option was “margin of victory.” If you were convinced a horse would win by a certain number of lengths, there was a (probably losing) bet for that. The winner, Good Magic, paid off at 8/5 for those who had the margin at 1¾ to 3 lengths. This option attracted $4,400 in bets. The “Grand Slam” was a parlay that asked bettors to choose a winner for the 10th, 11th, and 12th races — plus who would prevail in Sunday night’s ESPN-televised Cubs-Cardinals baseball game. A modest $4,200 was wagered on the Grand Slam. The winning ticket had Berned ($10.20), Imprimis ($4.60), and heavy Haskell favorite Good Magic ($3.00), who was a 1/5 shot for much of the day before settling in the end at 1/2, plus the Cubs. That winning combo paid out almost $70 on a minimum $2 bet. Drazin said afterward he would have been just as happy for the baseball segment to have been the Yankees-Royals early game, leaving the Haskell as the anchor leg of the bet. 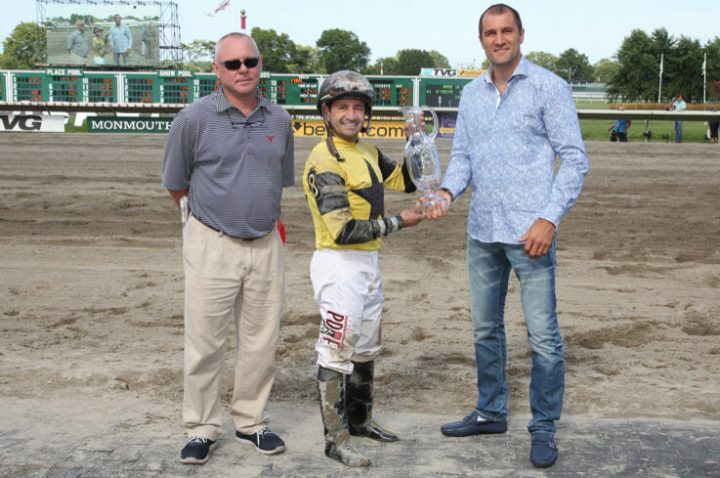 Will there be more offbeat betting at Monmouth Park next weekend and thereafter? Drazin said that is likely, adding that his bookmaker partner William Hill will drive that discussion in the weeks ahead. As for sports betting, Drazin said his weekend numbers after a month of action are settling in at just under $500,000 handle on Saturdays and on Sundays. That’s in the same ballpark as the Meadowlands Racetrack, which has only been open for three weekends. Big M owner Jeff Gural told USBets.com that weekend betting was “on the upswing” over the previous two days. Keep in mind that the Meadowlands wraps up its standardbred season with Saturday’s running of The Hambletonian. And while harness racing then goes idle there until October 12, the thoroughbreds — after concluding the Monmouth meet on September 9 — fill the void at the Meadowlands with races on Fridays and Saturdays in the three subsequent September weekends. The only fall weekend with no racing at all at the Meadowlands is October 5-6.